It helps to have deep pockets to shop at Britain’s only “zero waste” supermarket. Not only do none of its 200 products come with packaging, you have to bring your own containers. Earth.Food.Love was set up by the former Manchester United fullback Richard Eckersley and his wife Nicola. At the peak of his career Mr Eckersley, 28, fell out of love with football and into saving the world. Having played alongside Cristiano Ronaldo and Wayne Rooney, footballers not known for inconspicuous consumption, he said: “We have a 15-month-old daughter, Willow, and I have woken up and become vegan. I became more conscious about how much we consume and how we can tread more lightly on the planet. “Nothing comes through the door here unless it’s unpackaged and organic. We sell everything that’s dried, so you’ve got grains, beans, pulses, legumes, rice, seeds, flours, sugars, seaweed and spaghetti, yeast flakes and stock. We’ve got herbs and spices and dried fruit. The supermarket in Totnes, Devon, asks shoppers to bring their own pots, jars, bottles and paper bags. It supplies compostable paper bags for those who forget or are visiting for the first time. They do sell some liquids including maple syrup and apple cider vinegar but, being vegan, no milk or dairy products. Goods on offer include 50g of Assam blend tea for £3.50, 60g of Cornish seaweed for £4.72, and half a kilo of muesli for £2.17. All the products on sale are delivered to the store in 25kg sacks which are returned when empty to be refilled. 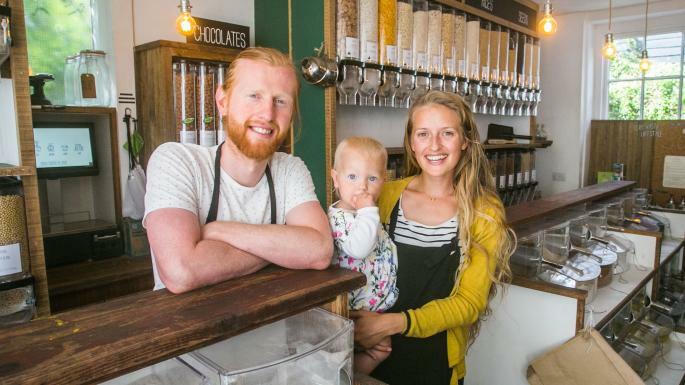 Britain’s first “zero waste” supermarket, Unpackaged, opened in Hackney, east London, in 2012 but closed two years later after its owner moved to larger premises and expanded to include a café. Mr Eckersley says Earth.Food.Love has dozens of satisfied customers saving money on their weekly shop because they don’t have to buy expensive packaging. Their strict ethos means it is impossible for them to sell staples such as tinned tomatoes or tomato paste. They also steer clear of fresh fruit and veg because Totnes has a weekly market and is full of organic greengrocers. Mrs Eckersley, 27, a former English teacher, hopes one day to open similar stores in London and Birmingham. The couple were inspired to launch the idea during a visit to Berlin where they came across Unperfekthaus, a German “zero waste” store. The store’s Zero Waste Lifestyle collection includes sanitary products, metal razors and bamboo toothbrushes that allow you to replace the bristles when they wear out. Don’t buy water in plastic bottles, buy a reusable bottle and fill it from a tap. If you dislike the taste of tap water, use a Japanese Binchotan charcoal stick from Black + Blum. Carry a lightweight foldable bag. They can be used many times and soon pay for themselves. Instead of using expensive chemical cleaners follow the Victorians’ example and use white vinegar and baking soda. Get your old folk a rocking chair that can charge electrical devices thanks to a pendulum, gears and a motor, a concept developed at the University of California. A Swedish company harvests energy from Stockholm commuters on the underground. Each person produces the heat of a 100-watt lightbulb, which is converted into energy in a heat exchanger and keeps travellers warm.